Val's Quilting Studio : Thank you for Participating!! 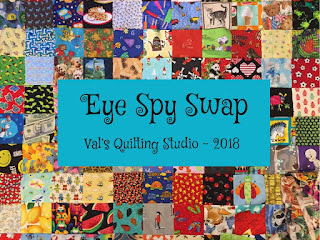 Our 2018 Eye Spy Swap is well underway. Everyone's busy seeking and cutting fun fabrics. I wrapped my two sets up this morning and will start to look forward to receiving all yours in the mail. Thank you so very much to everyone who was able to participate in this round. Future happy mail to come. I wish that I had the time to join in. I have out of state company, and they will be here between one and two weeks. That and gardening is keeping me on my toes, LOL. My blocks were mailed on Friday, priority mail, so you should receive them in a few days. My squares will be mailed Friday. I've my squares all cut up, just need to figure out the return envelope situation. I will likely be mailing on Friday or Saturday. Guys I love this about blogging. What fun! Such a fun way to increase the variety. Looking forward to seeing what's in all those packets.